A three-day workshop titled “Equity and social justice in a digital world: An inter-sectoral dialogue for a digital justice agenda” is held in Bangkok, Thailand during 25-27 March 2019. On the 2nd day Barkat Ullah Maruf, Assistant Director of COAST Trust gives a presentation focusing the case of Bangladesh in the global digital era. 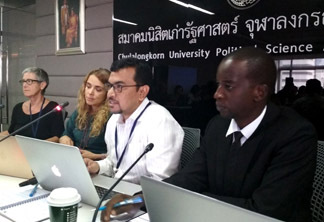 The workshop is held in the Auditorium of the Department of Political Science of the Chulalongkorn University, Bangkok, Thailand organized by Just Net Coalition. In this presentation the other speakers are Professor Jane Kelsey of University of Auckland, New Zealand, Ms. Burcu Kilik of Public Citizen in USA, Munu Martin Luther from Uganda. The session was moderated by Ms Jai Vipra of IT for Change, India. In that presentation he reiterates the necessity of understanding the entire digital concept ruling the world for trade. In the presentation he shows that the capacity of both the government and people are hardly at the required level to fight against the giant corporations behind the digital neo-colonialization. The students at the school level are learning ICT which is ended up learning Microsoft office and adobe photoshop instead of ICT itself and the global politics behind it. Sometimes it is felt that the government is dealing with the global situation quite well and their capacity is satisfactorily increased. However, when we see the Post Office, a public institution is given to Alibaba and Amazon to serve their purpose under a digital trade agreement, we understand we really need more capacity to understand the digital trade and at the same time we really need to have strength national position to oppose this kind of proposals where public institutions serves a corporate. This is a subsidy to a rich country company from the people of poor country. Moreover, there are some NGO interventions to create a field for corporations to come and do business. We have a a satellite thrown into the space before we have obtained the capacity to run it and what obviously happened is a foreign company is running the satellite and have the agreement not with the government, but with a business entity in Bangladesh. So, how the data security will be increased of this country? The federal reserve of the country is already hacked by taking the opportunity of digital illiteracy of the government and now this satellite controlled by a foreign company might expose the entire security of the national data. He stresses on the capacity building of the students on ICT, on artificial intelligence, on entire digital discourse to be able to fight back and restore the right of the people.